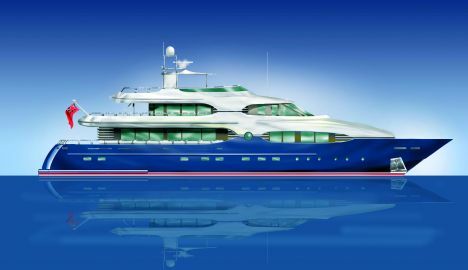 The super-yacht market of yachts between 35 and 45 metres arouses increasing interest from the main yacht builders dedicated to long distance cruising, including the English yard Pendennis Shipyard that, together with Laurent Giles, has set in motion the production of a 38 metre yacht with displacement hull. A great deal of attention was paid at design stage to the relationship between length and maximum beam; it offers advantages during navigation as well as providing larger interiors which is fundamental on a boat destined for ocean crossings. The end result is a voluminous yacht capable of offering 10-12 guests comfortable suites and luxury living. Another original characteristic of this project is the Jacuzzi on the sun deck together with an unusual daytime bathroom. The Pendennis 38 complies with the construction regulations established by MCA, Lloyds and ABS and because it is completely fitted out at the English boatyard, can be fully customised to meet the needs of each buyer. Powered by twin Caterpillars, 650 HP each, this Pendennis ensures cruising autonomy for approximately 23 days sailing at a speed of 10 knots, enough to face difficult crossings in total comfort. For further information: Pendennis Shipyard; The Docks; Falmouth; Cornwall; England; TR11 4NR; tel. +44 (0) 1326 211 344; fax +44 (0) 1326 319 253; web site www.pendennis.com; e mail info@pendennis.com. Naval Architecture: Laurent Giles Naval.